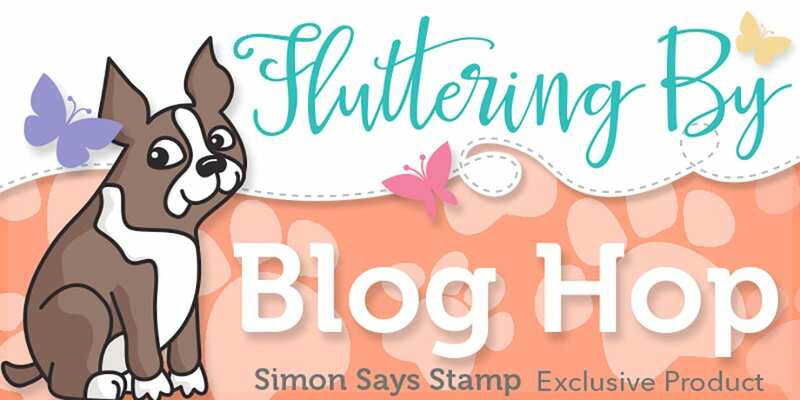 I’m delighted to be part of a blog hop today to celebrate the new Fluttering By release from Simon Says Stamp. There are more details on the blog hop below. 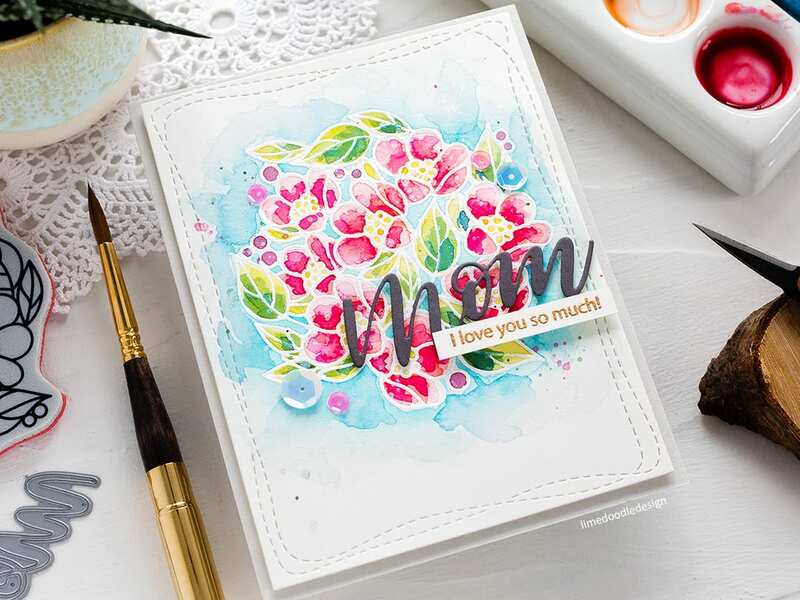 For this post, I have a video with a quick and easy way to add watercolouring to your cards using the beautiful Center Cut Flowers Background set. It is the way I started watercolouring and caught the bug! I’ve linked all supplies at the end of this post. Compensated affiliate links used. Here’s a quick summary of what is included in the new Fluttering By release from Simon Says Stamp. The Center Cut Flowers Background set joins others in the series: new Center Cut Burst and Center Cut Star and previously released Center Cut Heart and Center Cut Kaleidoscope. 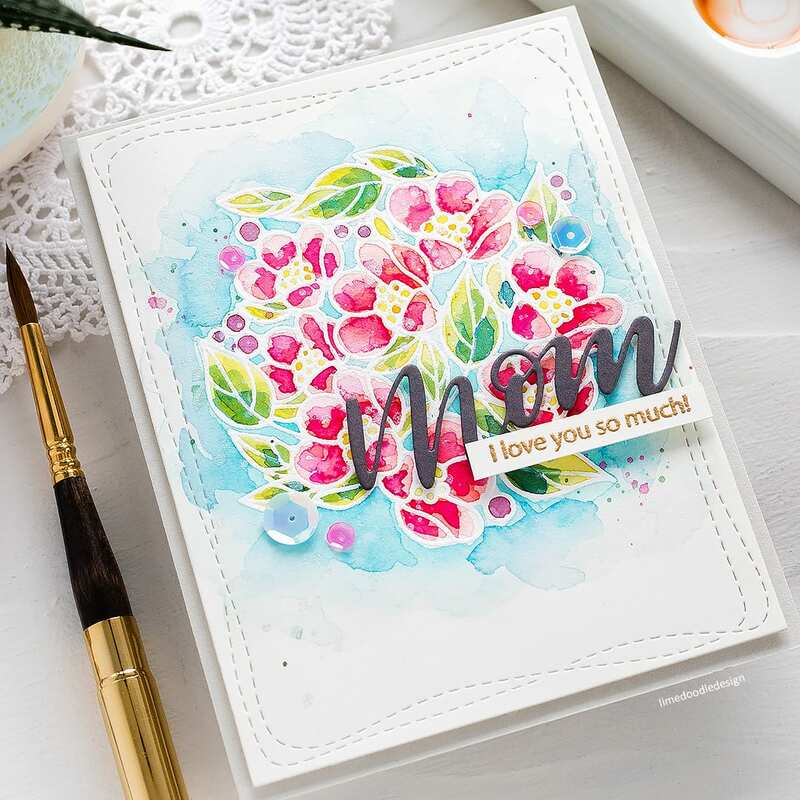 These sets are so versatile as the centre portion is removable so you can stamp the centre and frame together or individually. For today I’m using just the centre portion of the Center Cut Flowers set. I’ve always enjoyed white heat embossing floral images as I think it gives them a lovely light, elegant look. The lines are defined but yet don’t compete with the colours used. 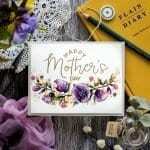 White heat embossing flowers in this way and then painting was how I got the watercolouring bug! On a piece of hot pressed Arches watercolour card, I stamped the centre portion of the Center Cut Flowers Background set in clear embossing ink and white heat embossed. I taped the card to a board to help prevent warping while painting and then watercoloured with Daniel Smith watercolour paints. However, you could use any water reactive media you have – Distress Inks, Clean Color Brush Markers, Gansai Tambi paints etc. I imagine that most crafters have something in their stash that they could pull out to watercolour. 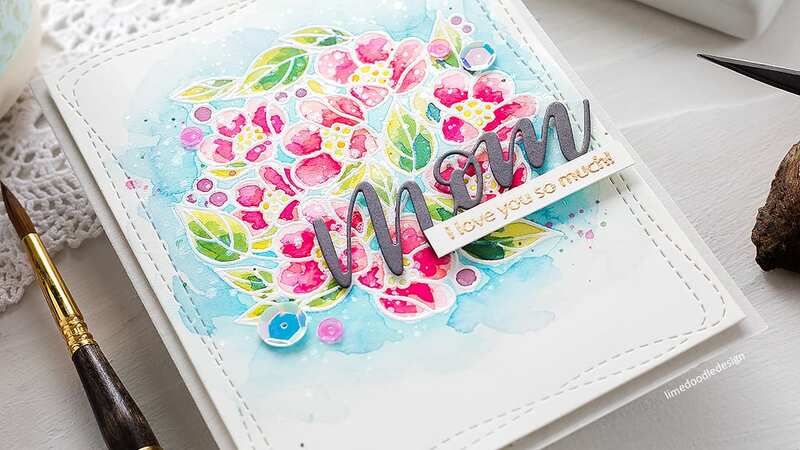 I used several layers of colour, loosely applied which emphasises how the heat embossing resists the watercolour paint – the raised lines of the embossing create little wells for the colour to pool and you get lovely variations in colour. When dry, I splattered the panel with a solution of Perfect Pearls and leftover paint from my palette then die cut the panel with a Wonky Rectangle die. For the sentiment, I paired the lovely Script Mom die, cut from Slate card with a sentiment from the Messages For Everyday set stamped in clear embossing ink on more of the hot pressed card and heat embossed with Antique Gold embossing powder before trimming to a skinny banner and adhering with foam adhesive. I added more foam adhesive to the back of the panel and mounted onto a Fog card base. Finally, I used a few of the new Peony Bouquet and Butterfly Kisses sequins help in place with Ranger Multi Medium Matte. 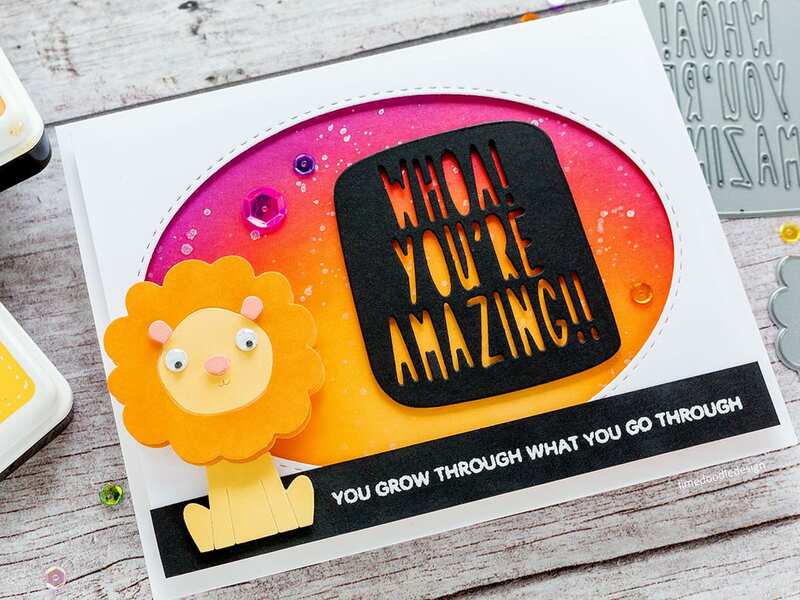 I love the Picture Book series of dies from Simon Says Stamp and made this encouraging card with lion action wobbler using the Picture Book Lion die, Whoa! You’re Amazing!! die and additional sentiment from the You Got This set. You can find more details on this card by visiting the original post here. 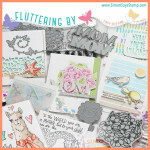 As mentioned above, this post is part of a blog hop to celebrate the Simon Says Stamp Fluttering By release. Hopefully, you’ve arrived here from Simon’s Blog, and that’s a great place to start if not. As with all good hops, Simon is giving away a $25 coupon to every stop on the hop from blog comments, so ensure you leave a comment below before you move on. Simon will choose winners over the weekend and post on the Simon blog on Wednesday. 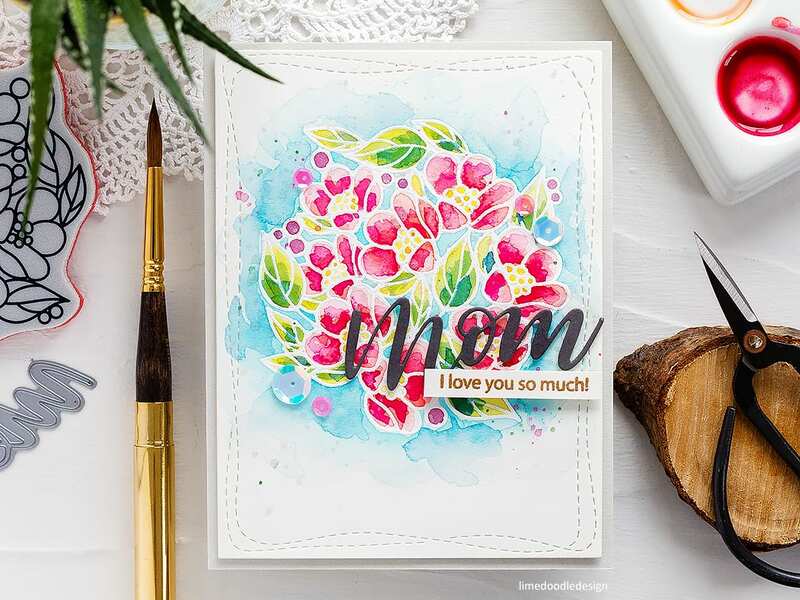 Gorgeous card, love this easy and quick(er) watercoloring technique!